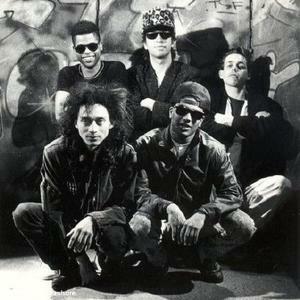 Urban Dance Squad was a rap/rock band which formed in Utrecht, Netherlands in 1986. The band consisted of Patrick Tilon (vocals), Ren? van Barneveld (guitar), Silvano Matadin (bass), Michel Schoots (drums) and Arjen de Vreede (turntables). The band issued five albums: "Mental Floss for the Globe" (1989), "Life 'n Perspectives of a Genuine Crossover" (1991), "Persona Non Grata" (1994), "Planet Ultra" (1996) and "Artantica" (1999) before disbanding in 2000. The band returned for a reunion tour in 2006. The band's rap-rock hybrid style was influential on several groups, such as Rage Against the Machine and a late 1980's tour with the Beastie Boys was what convinced the latter group to return performing their own instruments. UDS' single "Deeper Shade of Soul" was a hit in the United States, peaking at #21 on the Billboard Hot 100.